Army veteran returns home to find her Gilbert apartment burglarized. 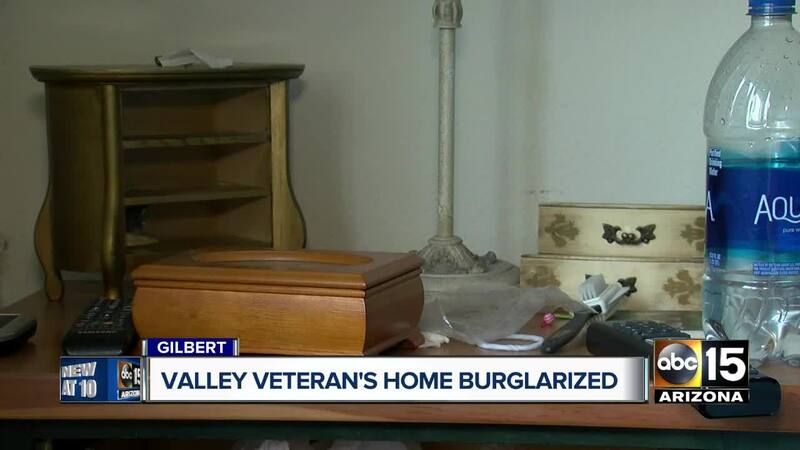 GILBERT, AZ — A Valley veteran returned home earlier this week to find her Gilbert apartment burglarized. Kimberly Wright said she was only gone for a few days on a trip to UCLA's Operation Mend in California. Wright said she was hoping to get help with PTSD and other injuries she said she suffered while serving in the military overseas. "My grandmother's jewelry box is taken apart and all my jewelry boxes are sprawled out on the bed and everything has just been cleared out completely," Wright said. Along with jewelry and valuables, Wright said whoever burglarized her apartment went through her entire place, searching through her closets and even breaking into her safe. "The cash that I had is gone, the medication I had is gone." Wright said she called the police and they're looking into the incident but above all, she said she's hurt. "A gold chain is a gold chain, not a big deal but when it's got history to it, when it's got sentimental value to it, there's no price on it. You know you can't, you can't get that back." Wright is hopeful that someone may return her items. ABC15 reached out to the Gilbert Police Department for additional information on this burglary, they have not yet responded.